This absorbing, heartfelt work uncovers the story of the real dancer behind Degas's now-iconic sculpture, and the struggles of late nineteenth-century Parisian life. She is famous throughout the world, but how many know her name? You can admire her figure in Washington, Paris, London, New York, Dresden, or Copenhagen, but where is her grave? We know only her age, fourteen, and the work that she did--because it was already grueling work, at an age when children today are sent to school. In the 1880s, she danced as a "little rat" at the Paris Opera, and what is often a dream for young girls now wasn't a dream for her. She was fired after several years of intense labor; the director had had enough of her repeated absences. She had been working another job, even two, because the few pennies the Opera paid weren't enough to keep her and her family fed. She was a model, posing for painters or sculptors--among them Edgar Degas.Drawing on a wealth of historical material as well as her own love of ballet and personal experiences of loss, Camille Laurens presents a compelling, compassionate portrait of Marie van Goethem and the world she inhabited that shows the importance of those who have traditionally been overlooked in the study of art. It was on an eighth grade school trip to the Chicago Art museum when I fell in love with the paintings of Degas. His painitings of ballerinas fascinated me, at that time I thought the life of a ballerina was one of elegance and grace. Of course, now I know it also includes a great deal of work and pain. This is a slim book, and instead of focusing on his paintings, though of course that is mentioned on well, focuses on a sculpture he made of a young ballerina. Her features distorted to look almo It was on an eighth grade school trip to the Chicago Art museum when I fell in love with the paintings of Degas. His painitings of ballerinas fascinated me, at that time I thought the life of a ballerina was one of elegance and grace. Of course, now I know it also includes a great deal of work and pain. This is a slim book, and instead of focusing on his paintings, though of course that is mentioned on well, focuses on a sculpture he made of a young ballerina. Her features distorted to look almost humanoid, the public found her ugly, unacceptable. Degas never showed this sculpture again. He had turned to sculpture because his eyesight had begun to fail, but at that time those were never accepted as much as his paintings.The book is part art history, part a history of the times, the young ballet girls called rats, from families who needed them to earn money at a young age. Degas himself and how his art was accepted and what as. "Edward Degas captured an unfiltered reality and provoked disquieting sensations. He questioned society. In this sense, he was much more a realist than Impressionist. His contemporaries, in fact, reproached him for pushing his realism to extremes.It was a well and good to hear down "the partition dividing the atelier from ordinary life" but he went to far in applying "the major rule of naturalism," which was to exaggerate physical and moral ugliness. "The girl in the sculpture was named Marie, she was one of the young ballet rats. It was a hard life, little money, little food. Not much is known about her but what is known is shared. An understanding of her comes from the realities of the time, how those working poor and women in general were viewed. Such luminaries as Zola, Matisse an others also have bits here and there. An interesting book for those who enjoy a slice of art history, but don't expect this book to just be about the life of young Marie. Honestly, I could sum up all of the actual historical information about Marie Van Goethem presented in this book in one paragraph. I can't decide whether reading this felt like reading a class-assigned essay that had an excessively large word count (so the student just prattled on and on without reason) or like reading something written by someone in love with the sound of their own words.In my opinion, the author comes off as many things: obsessed, imaginative, narcissistic, condescending. The Honestly, I could sum up all of the actual historical information about Marie Van Goethem presented in this book in one paragraph. I can't decide whether reading this felt like reading a class-assigned essay that had an excessively large word count (so the student just prattled on and on without reason) or like reading something written by someone in love with the sound of their own words.In my opinion, the author comes off as many things: obsessed, imaginative, narcissistic, condescending. The first half of the book, we have minimal historical information, spread across nearly a hundred pages by sheer verbosity, repetitiveness, and invention. What links the few bare facts about Marie Van Goethem's life and her time with Degas is an abundance of quotes from other sources and the author's personal fantasies of their lives. While I understand that without any personal conjecture by the author into the feelings of these historical figures this would be more of a textbook, her fantasizing in the first 2/3rds of the book is unruly. She states her assumptions and biases like facts, pitying and sympathizing, rather than as theories. In part 3, she admits to her overactive imagination and blames it on her strong empathy for Marie (really she should say the "imagined character of Marie" because she doesn't know her, can't ever know her, and is completely and fanatically taken with her own idea of her).The author spends many paragraphs sympathizing over Marie's poverty. While she does describe the historical conditions of Marie's life inside and outside of the ballet well, the same statements are repeated ad nauseam throughout the text. She alternates between reflecting Degas' personality and his personal flaws as described by accounts of his contemporaries and attempting to paint him more sympathetically. "Did they laugh together?" she asks. She spends an obscene amount of time dissecting all possible meanings of the sculpture, its position, it's materials, its relation to viewers of the past and viewers today, and its impact (or non-impact) on Marie's life. It reminded me of a pompous person at the local modern art museum who is pretending to know, rather than knowing, the meaning of a work of art. That's not to say the work has no meaning or that the meaning shouldn't be discussed, but half of her theorizing was in the form of rhetorical questions, had no support, and/or drifted away from the subject entirely. Maybe it's not even the dissection of meaning that bothered me so much as the tone. Her voice is that of an obsessive fan. I'm sure you have to be devoted to a subject to research it and write a book. Especially if that subject has such a dearth of information, and despite that fact, you continue to insist on publication. At times it's almost creepy to read her writing because of how obsessive she sounds. As though she wishes she could go back in time, meet Marie, become her best friend and spend the rest of her life staring at her. Even worse than the obsessive tone was section 3, which isn't really about Marie, the statue, or Degas at all. It's about the author's personal journey to bring this book to life. About how she, unlike all the others who had written about Marie, could not give up in search of the truth. She just had to know what happened to Marie after she was fired from the opera. All the other academics, authors, and art historians were content to forget about her after her time with Degas, but not this author! No, she was the noble one who would bring justice to Marie's memory. #eyeroll. This is the narcissistic tone I mentioned above. I mean, come on. I didn't buy this book to hear about the author's personal struggles and what she overcame to write this book. I bought it to read about the girl behind the statue. Her vain and extended explanations on her research process, the ups-and-downs, etc. are of no interest to me. Yes, it's cool to know how she verified Marie's birth date, but then she drifts from Marie to the handwritten records, and how the writing changes with time, and I wonder if my great-grandmother could have met Marie, and now let's talk about how my great-grandmother was the first Parisian in her family who moved there because she became pregnant before marriage and then gave birth to my grandmother whose father is *gasp! * unknown and possibly a criminal! I'm not joking. That was a real, multi-page digression that was completely unnecessary and only served to increase page count and stroke the author's ego. As I began this review, so I will finish it. I do not recommend this book. The complete biographical information of Marie Van Goethem contained within the book can be found here: https://en.wikipedia.org/wiki/Marie_v...You can also find the majority of information regarding the statues historical context and reception on the internet.And lastly, the author repeatedly states that the statue stands in fourth position. That is blatantly incorrect. You could say it's similar to fourth position, but it is NOT fourth position. It is a pose of rest, not a ballet pose. No ballet teacher in our time or Marie's would have considered her stance an acceptable fourth position. The book is rather oriented towards the writer's empathy towards the model rather than the sculpture itself. It is endearing to attest how warming a masterpiece can still be, but don't be mislead into thinking the complete mystery surrounding the model will be unveiled either, although it does bring some light about topics such as the exact birthdate. All in all, a good read for anyone who has enjoyed contemplating Degas' works. Having read the historical fiction The Painted Girls, when I saw Little Dancer Aged Fourteen on the shelf at my local library, I couldn't resist. So little is known of the girl who posed for the famous statue by Degas, the book is a mere 147 pages, most of it trying to piece together what is known of the young ballet dancers of the time with the reality of one. It's like a genealogy project that provides some answers, but leaves you with more questions. There is some interesting information about Marie van Goethem and the famous sculpture that Degas modeled after her in this book. Unfortunately, there’s only about 4 paragraph’s worth of it, and the book, though short, is over 140 pages. Aside from the few nuggets of actual information, the book is padded with the author’s musings, assumptions, and analysis, which were well-written and may be interesting to some, but were simply not what I was looking for in the book. So much of it felt so specu There is some interesting information about Marie van Goethem and the famous sculpture that Degas modeled after her in this book. Unfortunately, there’s only about 4 paragraph’s worth of it, and the book, though short, is over 140 pages. Aside from the few nuggets of actual information, the book is padded with the author’s musings, assumptions, and analysis, which were well-written and may be interesting to some, but were simply not what I was looking for in the book. So much of it felt so speculative that I often wondered why I was even reading it. This is a literary musing on the famous sculpture by Edgar Degas, Little Dancer Fourteen Years Old, in the vein of Eunice Lipton’s book on the model for Manet’s Olympia. The reader will not learn much about Marie Van Goethem, the model who posed for the sculpture, and the art historical information here is sketchy at best. Nothing except maybe the clarification of van Goethem’s birthdate is really new here. The literary parts of the book wherein the author imagines Degas’s working method with va This is a literary musing on the famous sculpture by Edgar Degas, Little Dancer Fourteen Years Old, in the vein of Eunice Lipton’s book on the model for Manet’s Olympia. The reader will not learn much about Marie Van Goethem, the model who posed for the sculpture, and the art historical information here is sketchy at best. Nothing except maybe the clarification of van Goethem’s birthdate is really new here. The literary parts of the book wherein the author imagines Degas’s working method with van Goethem in the room are new, but are based solely on the author’s imagination. There’s a smattering of errors that one will find annoying if one knows about this period of art (for example, the sculpture was not shown in the Salon of 1881; it was in the Exhibition of the Independents (Impressionist Exhibition) in 1881); missteps as to what kinds of sculptures were shown at exhibitions in this period (the statement “the marbles of Rodin, the bronzes of Carpeaux” makes absolutely no sense); and odd word usage (in which Degas is quoted as saying “you need to espalier yourself.”). An “espalier” is a noun for a type of tree, not a verb. There are enough of these errors to annoy the scholar, but that will probably go unnoticed by someone who just likes the sculpture because it is famous. The author brings herself into the story, as well as her own family history, and makes connections between herself and van Goethem that are sentimental but flat. The author cites her indebtedness to Patrick Modiano’s book Dora Bruder, but Laurens lacks Modiano’s ability to recreate the mood of a period. Having said all of this, it is a well-written book, lyrical, poetic when it can be, and if you accept that it is a literary fantasy based on very few facts, it’s enjoyable enough. Before reading this book, I thought of Degas as an impressionist who captured the technique of dancers and their glamorous world of the Paris Opera in the 19th century. Degas frequently depicted ballet dancers at class, on stage, or among their demi-monde patrons. I now see the réalisme of his art after having read this book that investigates the identity of a young girl he used her as his model for the "Little Dancer." When Degas first exhibited the "Little Dancer" , art reviews were harshly cr Before reading this book, I thought of Degas as an impressionist who captured the technique of dancers and their glamorous world of the Paris Opera in the 19th century. Degas frequently depicted ballet dancers at class, on stage, or among their demi-monde patrons. I now see the réalisme of his art after having read this book that investigates the identity of a young girl he used her as his model for the "Little Dancer." When Degas first exhibited the "Little Dancer" , art reviews were harshly critical- because the sculpture was remarkably unconventional, more like a mannequin than a finished sculpture. Displayed within in a glass box, the "Little Dancer" was made of wax , costumed in a bodice and tulle skirt, accessorized with green ribbon enclosed in a glass box. Did the artist intentionally wish to shock the public by exhibiting a sculpture that more approximated the model as a person and not the imagined idéal of the ballerine ? Did the "Little Dancer" repulse the public because she provoked guilty récognition of what the public did not wish to see- the harsh reality of little "rats" ,children contracted to endure long hours of punishing practice to escape poverty.I visited the Clark Museum in Williamstown where I saw one of the 22 bronze casts of the "Little Dancer Age Fourteen." The sculpture which is three-feet tall, stands in fourth position, her hands clasped behind her back, her chest trust forward, and her head, with half-closed eyes, tilted upward. After reading this book, my impression of the "Little Dancer" has changed. I now think that Degas, was dedicated to accurately and not romantically depicting the bodies of the dancers to convey the dark side of their world of poverty and despair. Laurens leads the reader to understand this world through her investigation of the identity of the "Little Dancer." The book is a great read. Laurens' research into the identity of the dancer, the socio-economic times in which Degas lived, and the personal life of Artist and model are interesting. The book leaves you with an enriched understanding of Degas and this well-known sculpture . I enjoy works by Degas! Receiving this book was a real joy!This short read is a bio on Marie Genevieve van Goethem, who modeled for Degas to earn extra money. She was a young dancer for the Paris Opera, but did not advance very far in the profession. It didn't pay very well either. The story also tells of her family and the poverty they suffered. One really never thinks about the models used in paintings and sculptures, so finding books written about them is really very fascinating. This one is I enjoy works by Degas! Receiving this book was a real joy!This short read is a bio on Marie Genevieve van Goethem, who modeled for Degas to earn extra money. She was a young dancer for the Paris Opera, but did not advance very far in the profession. It didn't pay very well either. The story also tells of her family and the poverty they suffered. One really never thinks about the models used in paintings and sculptures, so finding books written about them is really very fascinating. This one is well researched, but even someone not versed in art will enjoy the tale. It's a good one! What an interesting book! I discovered so many things about Degas, his work and the young girl who was the model for his statue of The Little Dancer. Incites to the ballet school in Paris during the 1880s and beyond. The author lets us see the side of Paris that is not often explored. The reader gets to know the dancer and her family and what they went through to survive. It talks about Degas' work and his reason for doing the statue. A fascinating read full of "I didn't know that" and "what was What an interesting book! I discovered so many things about Degas, his work and the young girl who was the model for his statue of The Little Dancer. Incites to the ballet school in Paris during the 1880s and beyond. The author lets us see the side of Paris that is not often explored. The reader gets to know the dancer and her family and what they went through to survive. It talks about Degas' work and his reason for doing the statue. A fascinating read full of "I didn't know that" and "what was Paris like at that time". I began thinking it was an imagination of the life of the model. I found, rather, a careful and thoughtful thesis delving into the relationships of artist, model, and sculpture. We meet Marie and Degas in their parallel lives and their respective roles in society. That sounds very academic, but the book rather creates a nebulus and then finds a spark of truth, I think.Fascinating read; drags a bit in the middle, and then really takes off. Stick it out until the end - it's worth it. Before this book, my knowledge of Degas and "Little Dancer Aged Fourteen" was limited to brief moments of admiration. This is certainly no longer the case! This book provides an excellent study of both subjects, and I would recommend it to anyone who's fascinated by art and art history. Warning, however, that the book reads like an academic paper, which some might view as dry. Interesting background about the model for Degas’ famous sculpture, though sometimes read more like a thesis on the artist. The author brought in a more personal perspective in the final chapter as well as the most information about the model, both of which I enjoyed. Way too textbook like for me. The author kept saying she did not want to fictionalize the little girl, instead she attempted to make the reader feel sorry for her. Not a good read and way off the mark as far as making me want to feel anything for the situation the girl was living in. Fascinating history of the time. I didn't love it just because it's not my typical genre, but the ballet and artists of the time, especially in Paris, have always interested me. Fascinating look, both at Degas, and at the culture behind the young ballet dancers of the time. To much unimportant detail, more of a non fiction historiography. Lots of details about the life of the poor young dancers. Important book. Beautifully written and translated. Whorls of thought. Degas, Marie van Goethem andfinally, Camille Laurens herself. Expressive andthough meticulous. 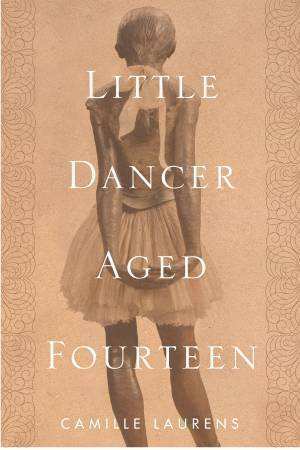 If you love the little dancer,you will love Laurens’ book. I received an uncorrected ARC in exchange for an honest review.Rating: 3.8 / 5In Little Dancer Aged Fourteen: The True Story Behind Degas's Masterpiece, Camille Laurens explores the story behind the girl who posed for Edgar Degas’ famous Little Dancer sculpture. We learn her name, Marie Genevieve van Goethem, and gain insight into the life of a “little rat” at the Paris Opera. Not much is known about her - her time spent working for very little wages at the Opera, posing for artists like Degas, I received an uncorrected ARC in exchange for an honest review.Rating: 3.8 / 5In Little Dancer Aged Fourteen: The True Story Behind Degas's Masterpiece, Camille Laurens explores the story behind the girl who posed for Edgar Degas’ famous Little Dancer sculpture. We learn her name, Marie Genevieve van Goethem, and gain insight into the life of a “little rat” at the Paris Opera. Not much is known about her - her time spent working for very little wages at the Opera, posing for artists like Degas, and what became of her after. Laurens quickly and vividly paints the picture of what van Goethem would have encountered struggling in late 19th century Paris as part of the young, working class poor.The book was more along the lines of a very long essay that I could have seen published in, for example, a journal for the arts. For such a short novel, I felt it was very well-researched, though I am no expert in Parisian or art history, and easily digestible for someone not familiar with the Little Dancer sculpture. Not only did I get a sense of the history behind Degas, as the famous artist, but I appreciated that Laurens took to telling the side of the story of those often overlooked in artwork. The book opened my eyes to the not-so-pretty history of the Paris Opera and impressions of those spectators who initially viewed the sculpture in the context of Parisian attitudes at the time. I thoroughly enjoyed how Laurens contributed pieces of herself and her experiences to the story, which I think made it easier for me to establish an emotional connection to the Little Dancer. Though I liked the book, I did feel at times that it was a bit disorganized or hard to track where certain parts were headed, like following along with Laurens as she conducted her research. I can understand though that some readers may be able to better appreciate making discoveries along with the narrator.